You can read all the celebrity gossip magazines you want, but it’d be hard to mistake the Earth’s biggest star. That’s right- the Sun hangs out at the center of it all, warming our planet and guiding our arc through space in its orbit. The Sun is responsible for day and night, the phases of the moon, our cycle through the seasons and the way we measure the year. Along the way, as days shift from shorter to longer and back again, the Sun takes the Earth through four notable pinnacles –the two solstices and the two equinoxes. While the phases of the moon are the likely inspiration for the length of a month, and weeks were designated 7 days most likely in honor of the visible planets, the way we mark days and measure years is guided by the sun in a 24-hour period, the approximate time it takes for the Earth to make one full rotation around its central axis. Along the way, we spend roughly half that time with our location on the planet facing the sun, and half turned away from its light. The Moon is often thought of as the opposite of the Sun, but the role it plays in our solar system is far different. The moon orbits the Earth as the Earth spins around the Sun. The moon’s orbit around the earth takes approximately 28 days, and there are almost exactly 13 moon cycles in a calendar year. The cycle of the moon has contributed to how humans have measured months and weeks through history. The cycle of the seasons has been the basis for legend and mythology, but it is actually caused by the way our planet orbits the sun. The Earth’s axis isn’t perpendicular to its orbital path; instead, it is slightly tilted. Through half of its orbit around the sun the northern hemisphere of the planet is closest to the sun, and during the other half the southern hemisphere is closer. This is why the seasons on the northern hemisphere are opposite the seasons in the southern hemisphere. Although seasonal shift is pretty mild in Arizona, most climates on Earth experience some variation on the cycle of a cold (winter) and warm (summer) season, each buffered from each other by the two transitional seasons of spring and autumn. The year’s Solstices mark the extremes of our path around the Sun – the shortest and longest periods of daylight annually. Winter solstice is the shortest daylight of the year, from sunrise to sunset, and the summer solstice is the longest daylight. The two solstices each year occur around June 21st and December 21st each year. In the northern hemisphere, summer solstice is in June and winter solstice is in December, while in the southern hemisphere it is flipped. Across cultures, people have celebrated these solar extremes with feasting, meditation and light. In the western zodiac, the calendar is built around the solstice and equinox points, beginning at the vernal (spring) equinox and moving through 12 signs. Opposite of the Solstices’ extremes, the two Equinoxes of the year mark the balance of the two days where daytime and nighttime are equal in length. The spring equinox is also known as the vernal equinox and the fall equinox is also called the autumnal equinox. 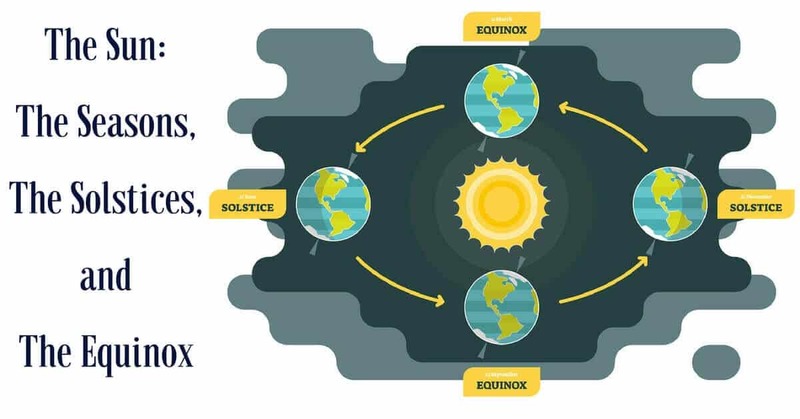 Through the Earth’s orbit around the sun, the equinoxes are the midpoint between the solstices. For the northern hemisphere, where you can find CC Sunscreens, the equinox falls around March 20th and the autumnal zodiac is around September 22nd. Here in Arizona, we can count on sun year-round with our shortest days hovering around 10 hours and our longest stretching to over 14 hours. The closer you move to the poles of the planet, the more extreme the shift in daylight. In Helsinki, their longest days stretch out to nearly 19 hours of sun but in winter contract to just 5 hours of sunlight. The closer you get to the Earth’s equator, the less fluctuation in daylight hours exist.